All available OpenMotics Modules are listed below. Select any of the devices for a detailed overview of the technical features, the available firmware and the hardware where it's made up of. Please make sure to read the Gateway module first because this is the center of the complete installation. Please make sure to read the Gateway module first because this is the center of the complete installation. For the Hardware information, schematics, PCB and others please consult the Gateway Module page. The Master controller: This controller, that is fitted on the Master PCB, is based on a Microchip 18F67J11 that is programmed in PicBasic Pro. This Master PCB also has a real time clock with Battery, an Eeprom and the necessary communication channels (RS485, RS232). 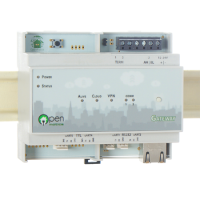 The Gateway module has multiple connections to the outside world: 2x RS485, 3xRS232 and Ethernet. The Ethernet, 1 RS485 and 2 serial connections are connected to the Gateway controller. 1 RS485 and 1 shared serial connection is connected to the Master controller. By setting jumpers, the shared serial connection will connect the Gateway controller with the Master controller over RS232. If needed and where appropriate, the shared serial connection can be used to access the Master controller directly over the built-in CLI interface (please see the CLI command reference interface for the different commands that exist). The CLI interface of the Master controller is also accessible through the Cloud interface (Maintenance mode tab). The Master controller is connected to the gateway over RS232. An API and CLI on the Master controller is available and can be found back in this Wiki. The old Gateway Module obsolete (v1) had only the Linux controller inside and the Master Controller was a separate Module. The current Gateway Module (v2) integrates both the Gateway and Master controller in 1 casing. The Output Modules has 8 bi-stable relays built in. Every 4 relays have 1 common connection. The module uses a Microchip 18F45K80 and is programmed in Pic Basic Pro. The source code can be found back in this wiki. The output module can be use as normal Relay module or as shutter module. When used as shutter module, Relay 1 and 2 work together and cannot be switched on together, 3 and 4, 5 and 6, 7 and 8. When 2 relays work together, those 2 relays will be used to connect to the 2 poles of the shutter motor. Those 2 poles cannot be activated together. The output module in shutter mode will prevent that the 2 poles will be powered together, even when the master requested to do so. Switching between normal mode and shutter mode is done be pushing the Init button for 10 seconds, when all 8 outputs flashes, the module is in normal mode, when 4 outputs flashes, the module is in shutter mode. For more information, please consult the Roller/Shutter mode page. This Module has 8 inputs to connect switches, motion detectors, pulse counter contacts, magnet contacts, etc. The processor of this module is a Microchip 18F45K80 and the firmware is written in Pic Basic Pro and the source code is available in this Wiki. The Hardware of this module is identical to the hardware of the Temperature module, just another front sticker is used and different firmware. The Dim Control controls up to 8 external 0-10V devices (dimmers, heating valves etc). The processor of this module is a Microchip 18F45K80 and the firmware is written in Pic Basic Pro and the source code is available in this Wiki. Connect up to 8 temperature, light and/or humidity sensors for increased automation (e.g. 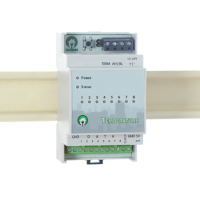 control the heating, close roller shutters, etc.). The processor of this module is a Microchip 18F45K80 and the firmware is written in Pic Basic Pro and the source code is available in this Wiki. The Hardware of this module is identical to the hardware of the Input module, just another front sticker is used and different firmware. Each sensor can measure temperature, light and/or humidity. The sensors are tested in combination with the Temperature module and are CE certified by Blue guide EMC Lab. OpenMotics allows the use of micro CAN switches. micro CANs have the advantage that they can use bus cabling allowing different switches to be connected on the same bus cable. * CAN Control: This is the controller that does the conversion between the RS485 Bus en the CAN bus. Every CAN installation requires minimum 1 CAN Control but can have more when more cabling rings are installed (per floor for example). * micro CAN: This is the module that will be installed behind the different switches and that allows connection of switches and leds. Depending on the model, the micro CAN can have additional sensors on-board like temperature, humidity and others. Every micro CAN, sensor and led that has been assigned in the CAN bus will take up an input or sensor position. Depending on the number of switches and sensors assigned, the CAN Control will create multiple input and/or sensor modules. Those modules will be added to the Gateway when initialization is performed. 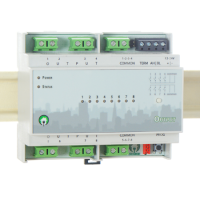 One CAN Control can have 240 inputs and 240 sensors assigned (which is the maximum of the total system). When multiple CAN buses are present, multiple CAN Controls can be used. The OpenMotics Energy module allows for up to 12 detailed power measurements using split-core current sensors and can be used in both 1-phase and 3-phase electrical systems. This page was last modified on 26 March 2019, at 11:40. This page has been accessed 60,382 times.